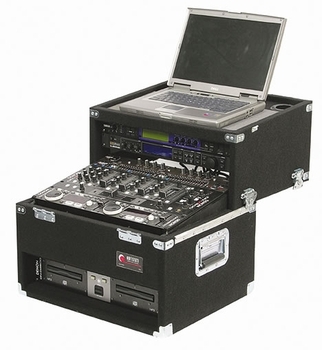 Odyssey CSL2802 Slide Style Laptop Combo Case Carpeted DJParts - All Variety of Parts that DJ Needs. Made to order. Providing a case for your customer gone digital is now that much easier with our new CSL2802. Incorporating our patented slide style design with 8 spaces on the mixer slant, 2 spaces on the slide back, and 2 vertical spaces below. Sitting above the slide section is a platform so your laptop or monitor sits unobstructed from the rest of your gear.